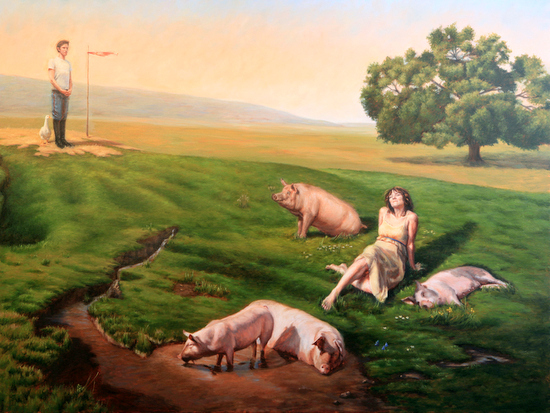 Carolin Peters, Under Days, Oil on Canvas, 48x36"
In her series The Journey, now on view at the Kwan Fong Gallery of Art and Culture at Cal Lutheran University, painter Carolin Peters has created an ambitious body of work that expresses the inner journey toward psychological individuation. Concerned with philosophical, spiritual and mystic phenomena, Peters creates narrative paintings that open up her ruminations on the nature of the true self. I recently spoke with Peters and asked her about her background, and the imagery of The Journey. 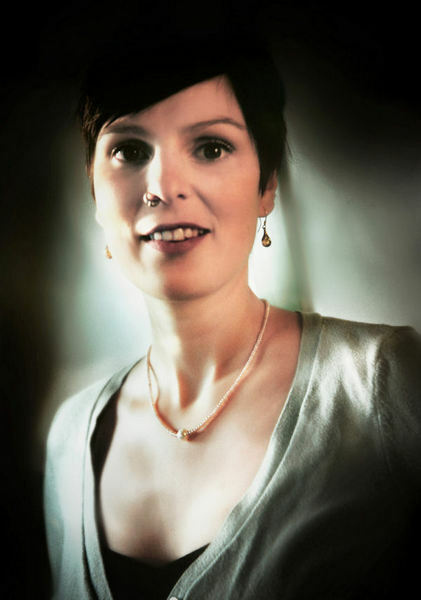 Carolin Peters Tell me about your childhood in Bavaria and how it shaped you. I grew up in a pretty remote, rural town in lower Bavaria. It was a super idyllic place and I spent most of my time outdoors, either running through the forest with our dog Twiggy or later at the farm where we boarded two horses. By constantly riding, walking or biking through the surrounding fields and forests I formed a really deep bond to the landscape there. My parents also took us to the nearby Austrian mountains a lot and that whole region is my quintessential ideal place. I was a super shy and quiet kid and having close bonds with nature and animals kept me connected to the outer world. Otherwise I probably would have totally withdrawn since it was hard for me to relate and care about "normal" stuff like sports and fashion. Instead I've always been interested in magical worlds, legends and fairy tales. I'd see a fallen over tree trunk and imagine stories of gnomes living in its root system. So my imagination was constantly fueled by what I saw and I still draw heavily from that. 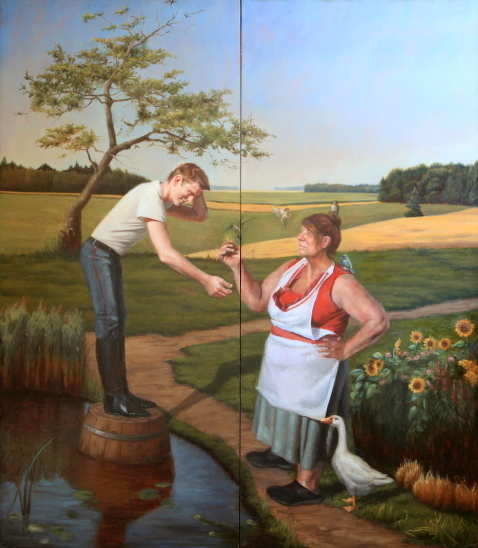 The Source, Oil on Canvas, 48x64" Growing up in Europe, what kinds of art were you exposed to? The first art I was exposed to were my great grandfather's paintings and sketchbooks. He traveled a lot and his paintings were in line with those of the Orientalists and Classicists. But he also had illustrations for children's stories, portraits of fellow soldiers and scientific illustrations of plants. When I first saw his sketchbooks I knew that I wanted to be able to draw like this. But whenever art was addressed in school I realized that I couldn't become an artist because I just had no interest in painting abstractly, making video art or creating installations. That's how contemporary art was defined to us in school anyways. So I figured becoming an illustrator was the only way to go. As long as I got a hold of those skills. I had no idea until I came to Laguna that there were still people out there painting realistically. Luckily we went to Munich's art museums regularly with school. So I got pretty well-steeped in all the greats from the Renaissance to Expressionism. Other than that, only after spending my first year in the States did I realize how much the local architecture had imprinted me: specially all those Romanesque and Gothic churches and castles with their elaborate ornamentation that are literally everywhere. Coming to the U.S. gave me a whole new appreciation for the "old" heritage that I'd taken for granted up till then. 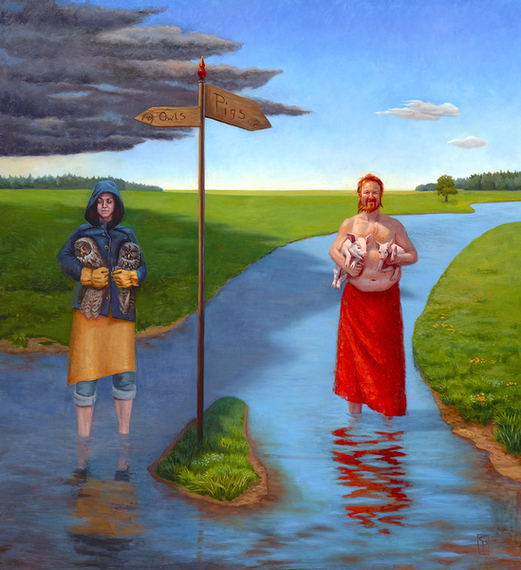 Episteme, Oil on canvas, 49.5 x 45.5" What did it feel like to come to the U.S. and study in Laguna? Who were your mentors at LCAD? Coming to Laguna was amazing. I had struggled a lot in high school and been made to feel academically inadequate. Finally I was at a place where I wanted to learn everything that was offered to me and excelled at it. Luckily I had a few friends that I knew already from earlier student exchanges, including my husband and then boyfriend Ben and so I never felt alone. But the community around LCAD became my family and home away from home. 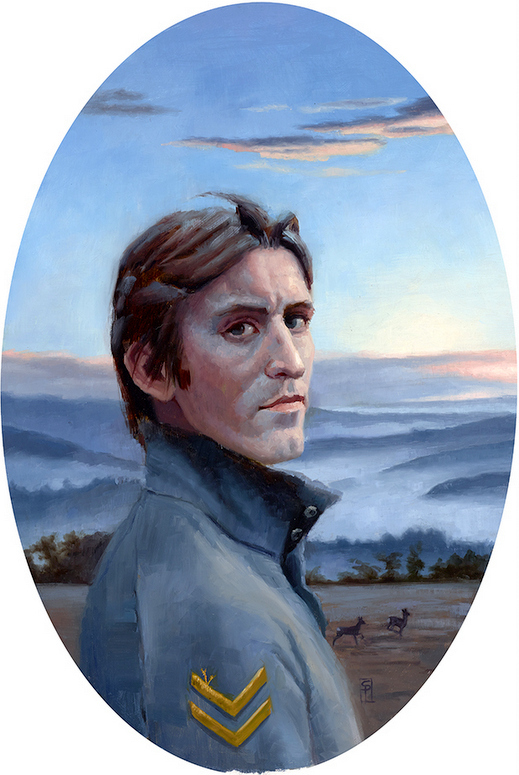 After seeing an eye-opening faculty show that included a breath-taking portrait by Stephen Douglas I quickly changed my major from illustration to fine art and my course was set right then and there. 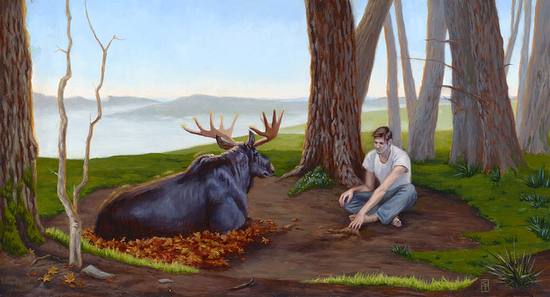 Stephen later became my mentor during the MFA program and so did F. Scott Hess. I had numerous inspiring teachers that had a huge impact on me including Sharon Allicotti, Darlene Campbell, Ron Brown and many more: I owe so much to them. Counsel, Oil on panel, 13x24" Tell me about your series "The Journey." How did it come about and how has it developed? When I graduated with my MFA degree I had a really tough time starting to paint in my new studio. I would spend days "organizing" the place and "preparing" stuff when finally my therapist at the time ordered me to "just push paint around" on a scrap surface and to do that religiously for the next few weeks without any expectations and demands of creating "serious" work. So I would pick my favorite pigment of the day and smear it around without any purpose other than enjoying paint-smearing (a terribly hard thing to do for someone brought up in a no-nonsense, everything-needs-a-function kind of environment). Inevitably I would always start to see something within the abstract marks and eventually excavate the image I was seeing. After I had done this for a month I laid all the scrap pieces of canvas out next to each other and realized that there was a narrative connecting all these seemingly random images. That's how the series got started. It got put on hiatus off and on and the images changed over the years but I wouldn't allow myself to sell off any of the pieces until I hadn't shown the completed thing as a whole first. I think it is very fitting and telling that the series is about an archetypal figure on a journey to himself since it spanned the time in my life in which I had to figure out who I was as an adult and as an artist. Beginning, Oil on canvas, diptych, 74x62" Can you tell me about one image from "The Journey" in some depth? I don't like to dissect the meaning of a painting for the viewer because that would imply that there is a right and a wrong way of looking at art. For me the exciting thing about art is that regardless of my motivation to create an image anyone can walk up to it and experience their own reaction to it. I think we can benefit from art by listening to how it makes us feel and to what it brings up in us, not because the oh-so-wise artist imparted some mind-blowing insight to the lowly onlooker. Of course I have my own narrative in my head as I craft a piece and I work very hard to have my composition, color scheme and paint application support it. But the goal is to make a good image, not to make everyone agree with me. But I will gladly tell you about the creative process now that I stepped off my soap box. As I said earlier, I started with this accumulation of over 30 painted sketches, which I then whittled down to 20 final ones. Before I started every new piece I would spend some time on finding better compositions and figuring out color schemes. About a year ago I got really burnt out and I was ready to give up on the whole thing. My interests had shifted and the series felt like a piece of led on my leg. I was tired of some of the earlier characters and only really wanted to work on animals. I felt like I was just rendering out earlier images that didn't mean that much to me anymore. Luckily Ben reminded me of the fact that I am painting about somebody's journey and that I should have the right to change course on my own. So I chucked a lot of the ideas that didn't resonate anymore and either started brand new ones or recycled the initial idea. Audience with the Coat Bearer, Oil on Canvas, triptych, 36x80" Audience with the Coat Bearer, for example, is the same format as the sketch but the original sketch had the protagonist bowing in front of an old crone on a mountain pass with a castle in the distance and the scene was flipped the other way. I still think it would have made for an interesting image but I wasn't in that frame of mind anymore. Open Field, Oil on panel, 17.5 x 12" Tell me about how you see your situation as a representational artist making serious work at a time when Postmodernism seems to dominate. I'm not sure. Being an artist is hard either way. Whether you are in line with current trends or not. As long as you are doing the hard work of confronting yourself and listening inward there are always going to be challenges. I didn't get into this because I wanted to be sanctioned by the higher echelons of the art world as valid. I paint because I love images and the silent stories they tell. I don't really care if they are categorized as art or illustration or neither. I care that I paint well and that people get to see my work. At times it seems hard to find spaces to show my work with but I can't obsess over if it has to do with my not adhering to postmodern criteria. That just ends up frustrating me and cutting into my painting time. I love animals and being in nature. I almost decided to become a horse trainer but my parents thought that it wouldn't make for a very lucrative career. So I decided to take the safe route of being an artist. But seriously, I need the quiet and solitude of nature to recharge and the companionship of animals to find my center. I think animals really show us who we are because they don't take your masks for real. Being able to commune with them as equals is one of the most rewarding things ever. Other than that I started experimenting with dissection and taxidermy of fresh road kill. I've been teaching artistic anatomy for a few semesters and that has been so enriched by this practice. Nature is amazing at how inventive and efficient it is. Everything is built in perfect order. It's truly awe-inspiring. It's also sobering to reveal during a dissection the trauma inflicted on these animals by our cars. Who are some living artists that you admire? Ruprecht von Kaufman, Paul Fenniak, Aaron Wiesenfeld, Jenny Saville, Julie Heffernan and Odd Nerdrum.